Rub by hand the flour with the vegetable oil in a large bowl, so all the grains get coated with oil. 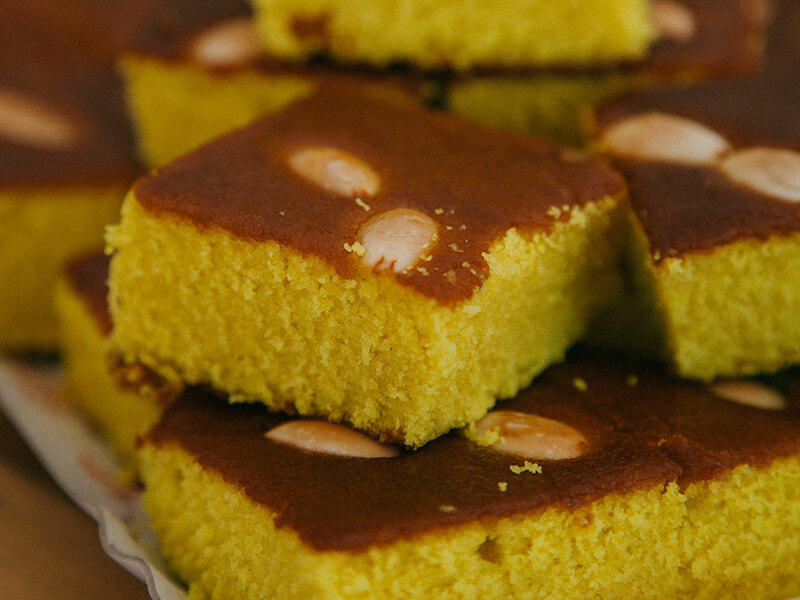 Dissolve the sugar and turmeric in the milk, then add it to the flour, and whisk to obtain a smooth batter. Use a 10-inch (25.5-cm) diameter round cake pan (or similar in size, rectangular or square), but instead of buttering it, spread the tahini all over the inside, so the cake won’t stick. Pour the batter into it, even it out, and disperse the almonds evenly on top. Bake for 50 minutes, or as long as needed to cook it through (check it with a cake tester, which should come out clean). Let it cool on a rack, then cut into pieces and serve at room temperature. Sfouf keeps for more than a week in an airtight container.